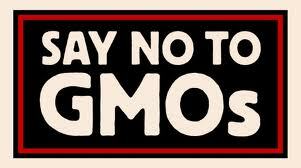 If you follow my blog or my face-book page you already know what GMOs are, but here is the basic definition -Genetically modified foods (GM foods, or bio-tech foods) are foods derived from genetically modified organisms (GMOs), such as genetically modified crops or genetically modified fish. GMOs have had specific changes introduced into their DNA by genetic engineering techniques. These techniques are much more precise than mutation breeding where an organism is exposed to radiation or chemicals to create a non-specific but stable change. The scientist at Monsanto started inserting genes from bacteria and viruses into crops. That’s were they got a crop that could either survive a application of the company’s herbicide glyphosate (roundup) or produce its own insect killing pesticide. Coming soon the USDA will be approving Agent Orange resistant crops (this have been proven in studies after Vietnam to cause cancer and birth defects). Research has shown lower levels of nutrients in crops sprayed with Roundup. These crops are specifically engineered to tolerate the herbicide Roundup, whose use has increased with the release of Roundup-Ready GM crops. Glyphosate, the active ingredient in Roundup, decreases nutrient availability and uptake in plants. Some of these nutrients help plants and animals fight disease. Recent studies have shown a link between high rates of spontaneous abortions and infertility in livestock fed GM Roundup-Ready crops. We know very little about the effects of genetically modified organisms on livestock and human health. Researchers in Italy have performed a study on some of the effects, and their results were released last year. They fed one group of pregnant goats rations with non-GM soybean meal and another group with GM Round up sprayed soybean meal. The mothers received this diet for two months prior to the birth of their kids. Then the offspring were fed milk only from their mother for 60 days. The results showed DNA from the GM Roundup-Ready soy in the blood, organs, and milk of goats. Also, the kids of the mothers fed GM soy had substantially higher levels of an enzyme, lactate dehydrogenase (LDH), in the heart, muscles, and kidneys. Similar metabolic changes have been found in studies of GM-fed rabbits and mice, as well. The word is spreading that rabbits fed pellets from company’s that use GMO grown products in the manufacturing of their pellets are getting sicker. 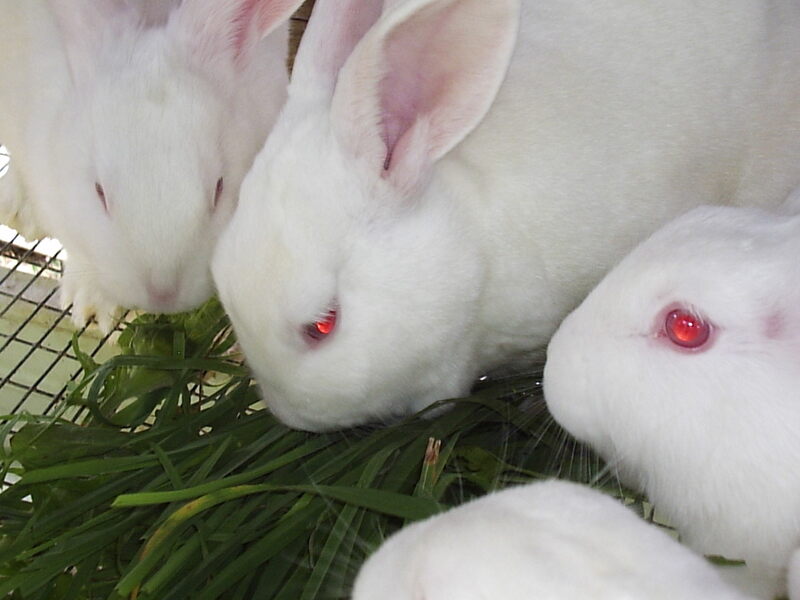 Laboratory GMO fed rabbits have had organ damage, reproductive failure, high death of kits, stomach legions, smaller bodies and organs, low immune responses, and higher death rates. There is no actual facts that I have, just resource’s and articles I have found. The way a rabbits digestive system works is that the beneficial bacteria that needed in the gut must flourish and adapt to their food source. If this bacteria is off it will cause all kinds of digestive problems such as enteritis, bloating, wasting away and more! If the bad bacteria starts flourishing this can cause coccidiosis and other problems. Last year I have had a rash of emails, phone calls, people stopping by the rabbitry to ask questions about problems with their rabbits. The only common factor in all these cases is the use of GMO pellets. Not just in one area (from California to Maine) or season (Spring to winter)! I do not believe that they are stress related. I am lucky to feed the lowest amount of pellets I have too, to keep my rabbits productive and healthy. By feeding rabbits a more natural diet and keeping a closed herd, has been the best thing for me and my rabbits. A German farmer who had 65 cows die after he fed them genetically modified Bt corn has filed criminal charges against Syngenta, alleging that the company knew the corn could be lethal to livestock, and covered up deaths that occurred during one of their clinical feeding trials. Swiss bio-tech Syngenta committed a grave criminal offense by deliberately withholding the results of a feeding trial in which four cows died in two days. The deaths prompted the company to halt the test. No health problems or deaths were reported in the control group, which was not fed the genetically engineered Bt 176 corn. Thousands of livestock deaths have also been reported across India, as a result of grazing on genetically engineered crops and feed. Alfalfa is the number one forage crop in the United States. In January 2011 the USDA approved the release of genetically modified (GM) alfalfa, raising the prospect that some non-GM alfalfa will be contaminated by GM alfalfa by cross-pollination from bees (could this also be the health problem bees are having?). Soon the first cuttings of GM alfalfa will be harvested and fed to livestock and be in your rabbit pellets with the GMO soy products. I have been called a conspiracy theorists but is this a way to control the food supply. You will not be able to raise any animals without the use of GMOs. This is why I push the Natural diet for us and our rabbits! Please comment your thoughts and ideas! I am a big fan of using every part of an animal. It’s not so much about frugality but that I feel a need to not waste anything and respecting the animal we raise and eat. It is sometimes a challenge to figure out what to do with a whole animal and using all its parts. I have found that learning how to butcher and use all the parts of a rabbit is a good way to start. Rabbit is the best livestock to begin with butchering! It is usually easy to find readily available, small enough to handle, and its anatomy scales up to the anatomy of a pig, lamb, or goat. If you can butcher a rabbit, you can butcher the bigger animals, too! The cuts are very much the same, just a easier to handle. I make many different dishes out of my rabbits, it is a tasty way to use the entire animal. The front legs make great buffalo wings for a great appetizers, the bones, head and ribs can be boiled for stock, and the rest of the rabbit can be roasted, baked, braised, and barbequed. There is SO much you can do with rabbit! From a Green standpoint, if you look at the amount of land, food, and time it takes to raise large animals like lamb, pigs, cows, and goats you see that rabbit is a easy sustainable item that’s healthy, versatile, and not expensive, especially when you buy it whole or raise it yourself. The rabbit head and brains are eaten in many countrys, and there are many recipes using both. For example Rabbit Head Pasta http://fxcuisine.com/default.asp?language=2&Display=159&resolution=print and Spicy Sichuan Rabbit Head http://showshanti.com/eating-rabbit-head-tu-tou/, are just a few, but heads are traditionally used in stews and stocks. Dog owners feeding their pets a raw food diet say their dogs love the heads and I have also seen them fed to pigs. The head can be crushed and fed to the chickens, the blood, bones, and meat is considered good for the laying hen, and blood mixed in the mash can be used for the same purpose. In Europe rabbits are sold with the head on, this is cooked or used for soup stock. The brains can also be used for brain tanning the pelt. It is said that the size of every animals brain is enough to tan that animal’s pelt. The heart, kidneys, and livers are very nutritious and tasty, to eat alone or used in a rabbit pot pie, or for stuffing and sausage, there are also lots of recipe’s available for these. The Lungs though fine for human consumption, no chef, or farmer we spoke with had heard of using rabbit lungs in cuisine. But I have dried them with the ears, and sometimes the liver (cut into pieces to be dried) for dog treats! Or you could just feed them fresh to your dogs. Rabbit blood can be used to thicken sauces and make charcuterie. If you do not want to eat the blood you can mix it with sawdust and it makes a great soil additive or add to the compost. You can also mix the blood in chicken feed for that extra protein. The offal guts and other left over butchering scraps can be fed to dogs, cats, pigs, or also put in the compost pile. Rabbit offal (the guts, internal organs, and non-flesh soft parts) are prized food in some cultures. They can be ground with a household meat grinder and used to make sausage, haggis, pate’, or other tasty tidbits. My first choice for anything I am not going to use is to feed to carnivores. Most zoos, fur farms, hunters or even your own pets will happily take it off your hands. A pig would probably eat it. My Muscovy ducks and chickens will run to the offal piles at butchering time trying to get some scraps! Third choice is your compost pile with some management insect nuisance, odor, and animal attraction is no problem. The problem with rabbit parts is that they decompose slowly. The moisture and the heat of a compost pile works well for the breakdown of vegetable matter, but in the case of animal parts it can attract maggots! Because of this slow decomposition this can also offers a place for unhealthy bacteria and rodents. By tossing a handful or two of lime on the rabbit parts this will help speed the decomposition. Cover the rabbit parts with a good amount of sawdust or shavings. Then compact this down tightly. This will reduce the odors. Have strong, tall sides to your compost pile (I use pallets) and cover the top with a tarp. This is further protection against animals getting into your pile. So the next time you have rabbit products to dispose of, use your compost heap. The rabbit feet can be used with the offal or made into lucky rabbits feet by drying and adding some beads or other decorative items for some really cool looking charms. You can make these by putting some 70% isopropyl rubbing alcohol in a small jar with the rabbits feet completely submerged in the alcohol, soak for 2 days this will lock in the fur. It also dehydrates the cells and kills bacteria and fungus. After the 2 days take out and rinse with water, you will need some borax this can be found in the laundry sections in most grocery stores. Using another jar or you may empty, rinse, and dry the jar you used earlier. Now mix some borax and water to about a 15 to1 mix use hot water as it will help the borax to dissolve. The borax will help to dehydrate skin and tissue helping to preserve the foot, also has antibacterial and antifungal properties. Make sure to submerge the feet in this mixture for one day. After one day in the borax mix I take out a put the feet in the sun to dry. Brush clean and you are ready to decorate with beads, and a end cap there are so many ways to dress up your new lucky charm. My wife dyes fiber with Kool Aid and white vinegar I want to try this with some of the white rabbits feet. The rabbit’s tail has been used for many centuries for pollinating flowers, by attaching the tail to a stick and going from the male flower to the female flower transferring pollen in hoop houses and greenhouses. You could also use these as charms. These are the uses I have found for using the rabbit from Nose To Tail, if you know of any more please let me know and I will add to this post!